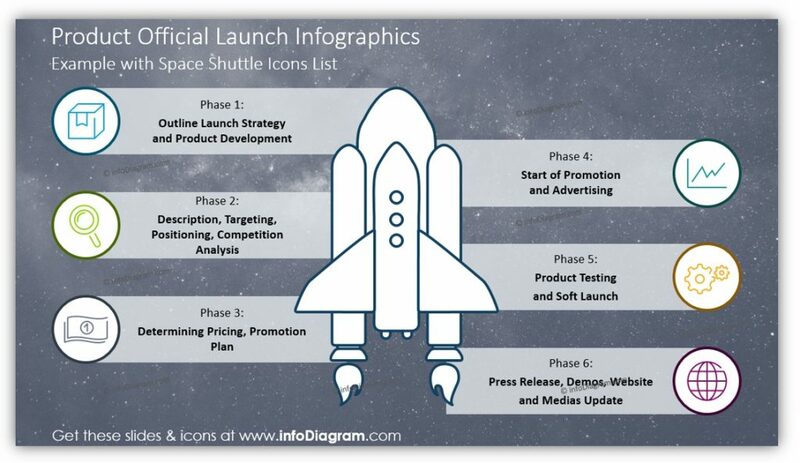 Leverage a clever visual metaphor by using rocket launch infographics or steps to illustrate product launches or company growth. You can explain various stages of a launch process or your company’s progression across milestones. 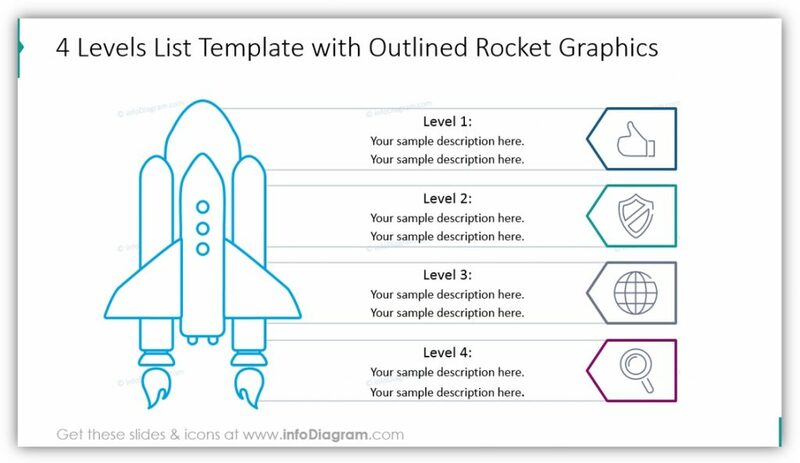 In truth, a rocket launch as a visual process is an apt metaphor for any consequent stage process, ordered event list, or development within your organization. 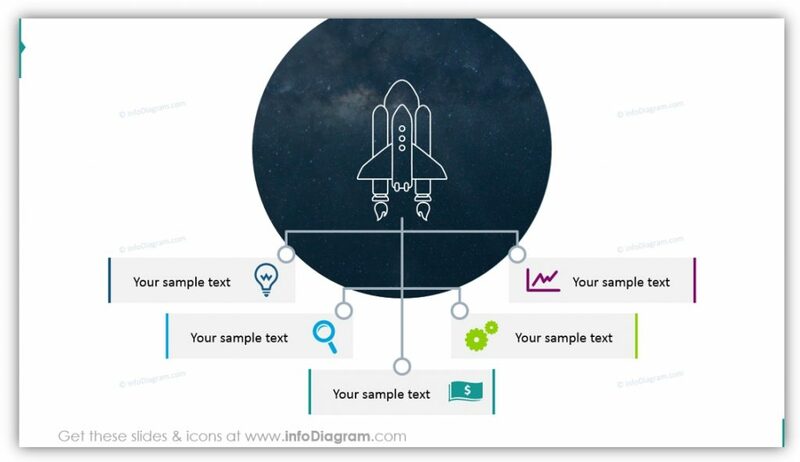 All example slides below are accessible in Rocket Launch PPT Diagrams (see details by clicking the pictures). High contrast slides with an Earth horizon background create a stunning, eye-catching slide perfect for introducing goals to your audience. You can provide details of your goal in a text box to make it easier for your audience to read on the dynamic background. You may customize the icon used to accentuate the text box with something relevant to the specific goal you’re discussing. Using eye-catching imagery to explain your launch, process or goals will help your audience to pay attention and retain the information you’d like to share. The icons and text used to develop each step in the process can be customized from the shapes used to the colors they appear – all to match your brand and messaging. You can provide additional details with larger text boxes and labels of the phases of your process. Whether you’re discussing a product launch or a series of company milestones, you can provide the information in a logical way that your audience will be able to easily follow. If the dark icons and imagery feel too heavy for your audience or for your intended message, using outline graphics from this set can provide the same information and benefits, but with a lighter, more modern look. Would something like this be more appropriate for the audience you’re writing for? Only you can decide. 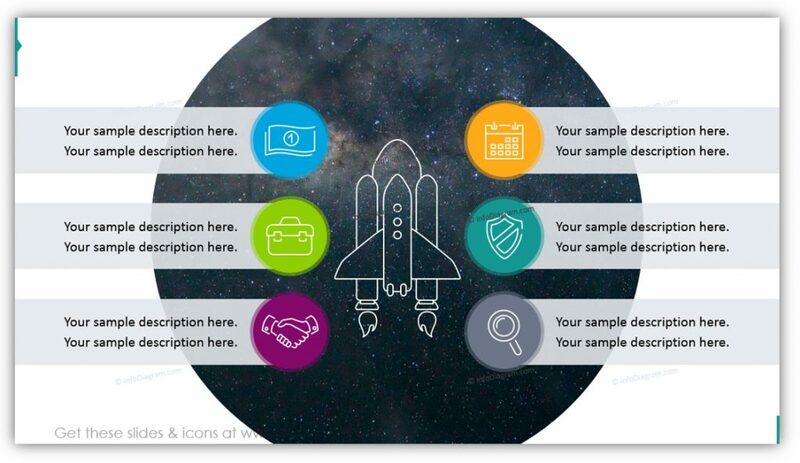 Funnel icons can be used to share a wide variety of information and tell many stories, as shown here. 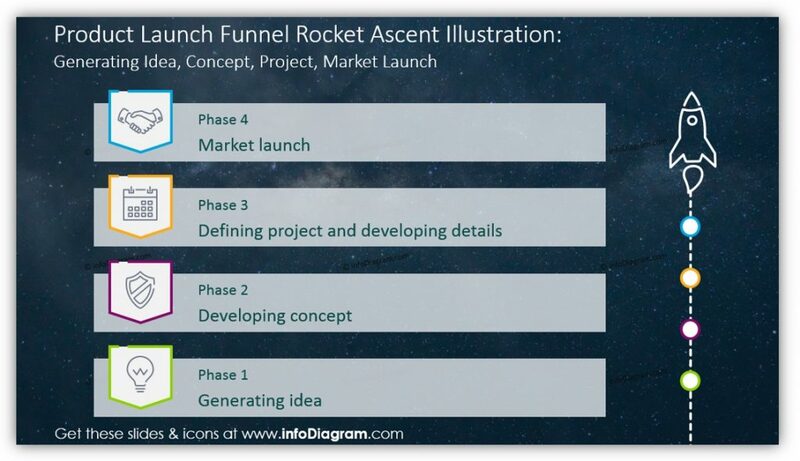 Rocket ascent illustrations are yet another creative way you can present a product launch funnel. You can use eye-catching visuals like horizontal rocket trajectory or rocket ascent to explain product launches or timeline progression. By choosing icons with a light, modern feel or dark, sophisticated vibe you can tailor your presentation to your audience and brand message. 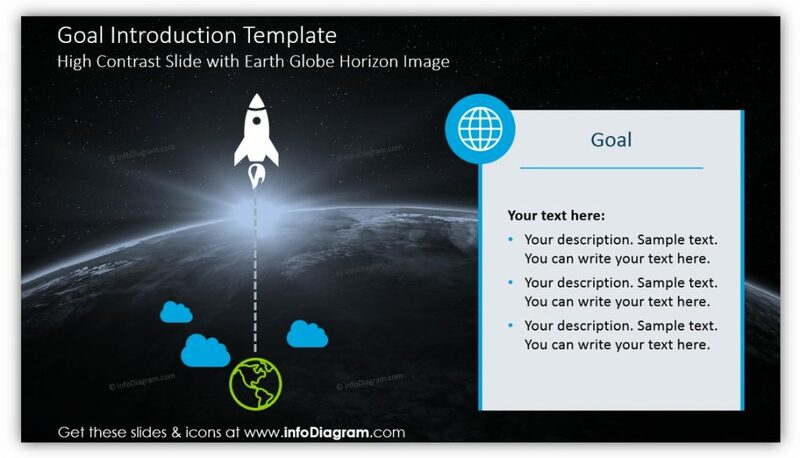 You can provide details about a project, process, or launch without defaulting to boring, cookie-cutter slides. Resist the urge to use the same boring slide templates when sharing important information. 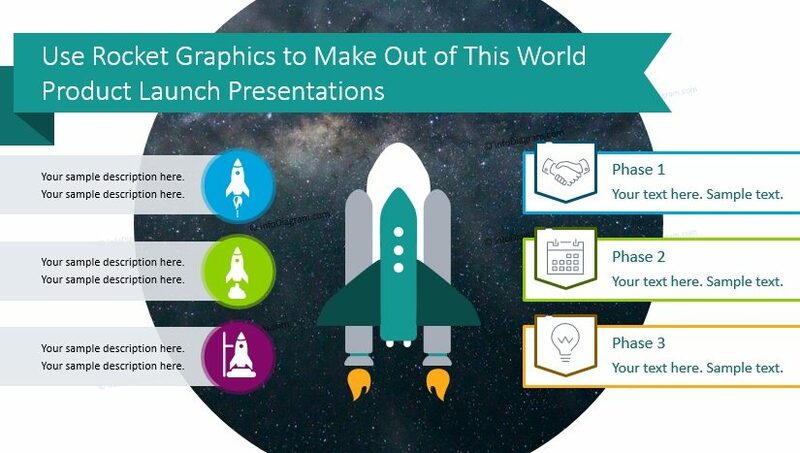 Rocket launch graphics can help you take your presentation to the next level by driving home your launch process or timeline. Showcase your company’s growth in a way that is easy to understand at the base level, because how you got there may be complex. Your audience will thank you for not using text heavy list slides to make your points, as they’ve seen those dozens of times.